Cambodia are out of contention for this year’s SEA Games honours following three straight defeats against ASEAN heavyweights which unfortunately, they had drawn in Group A of the biennial championship this year. And Friday Night rounded off what had been a generally disappointing outing for Lee Tae Hoon and his men even though the Cambodians still have the game against Malaysia to play for today. 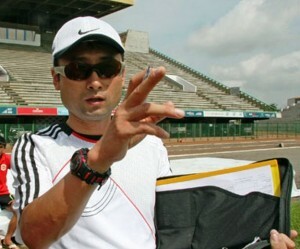 “For the SEA Games this year, we are really in a tough group,” Tae Hoon told www.aseanfootball.org. “We were given some hard lessons but I think that it is important we take these lessons to better prepare us for the future. The Cambodians could not have asked for a harder opponent in their first game then taking on hosts Indonesia whom they succumbed to a 6-0 defeat. They then bounced back in their second game to be more competitive against Singapore, when they took the lead. But inexperience and lack of fitness in the second half allowed the Young Lions to claw back for a 2-1 win. And Friday night, Thailand’s hold was complete when they curtailed Cambodia to just a smattering of shots before winning 4-0. The Indonesian press have likened Cambodia’s place in Group A as a pigeon being caged with several cats.